"Do More Faster is a locked-room all-nighter with David Cohen, Brad Feld, and the impressive mentors to TechStars; it is candid, smart, and spot-on. This is some of the very best advice entrepreneurs can get anywhere. " "When it comes to pragmatic advice—as well as examples highlighting real-world results—Do More Faster is a full-course meal." "If you have an idea and a dream, read Do More Faster! it offers a unique opportunity to hear first- hand what to do (and what not to do) to build and scale your business." Absolutely! Here is sneak peak right into the book that's helped thousands of startup founders. "Startups do almost everything at a disadvantage. Initially, most startups have less money than their competitors. Startups have less credibility. They have fewer customers. They have fewer employees, which means there are typically fewer people focused on things like marketing, sales, and product development. Resources are scarce at a startup. If there's one competitive advantage that most startups have, it's that they can do more faster. And because they can do more faster they can learn more faster. They can immediately throw things away that don't work because nobody cares anyway. Nobody is trying to protect a brand that doesn't exist, and nobody has any reason to be afraid of small failures. Startups know that's just part of the process. When you ask CEOs of major companies what they're most worried about, one common answer is "a couple of guys in a garage somewhere." Why? Because their larger and more established competitors have too much to lose to try something radically different. There's too much at stake for these large companies to try to blow up the market to disrupt the existing players. Relatively speaking, startups have nothing to lose and everything to gain by trying radical or non-obvious things. Larger companies are often baffled at just how much a startup can get done and it scares them. One of the things we talk about with our startups at Techstars is that they simply have to do more faster. This doesn't mean doing random stuff -- they still have to be thoughtful. But if they're not hyperproductive as small, nimble companies, then they're fighting from a real disadvantage. If a startup can't do more faster, it usually gets dead faster." "If a startup can't do more faster, it usually gets dead faster." What does 'Do More Faster' really mean? 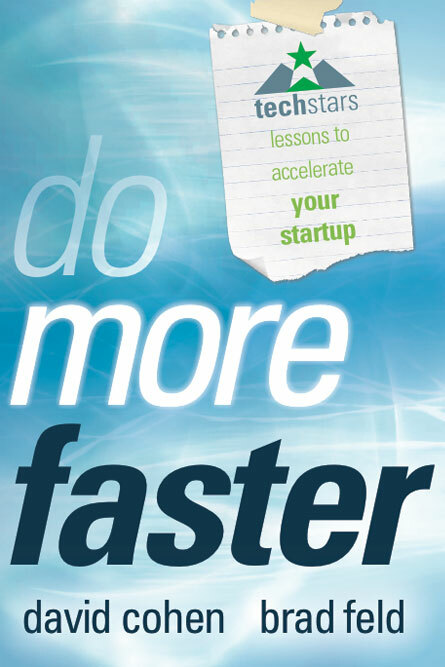 Do More Faster is a collection of advice that comes from individuals who have passed through, or are part of, Techstars' accelerator programs. Each vignette is an exploration of information often heard during the Techstars program and provides practical insights into early stage entrepreneurship. While you'll ultimately have to make your own decisions about what's right for your business, Do More Faster can get your entrepreneurial endeavor headed in the right direction. It is a cold, hard fact of business life that most startups fail. Even many of those entrepreneurs who ultimately succeed have stories of personal challenges, unsuccessful companies and difficulties along the way. The founders of Techstars have worked with entrepreneurs and companies over the past twenty-five years, and have seen a number of the same issues come up again and again. The authors organize the most critical issues into seven themes: Idea and Vision, People, Execution, Product, Fundraising, Legal and Structure, and Work and Life Balance. Many of the examples are personal experiences from the entrepreneurs themselves, integrated into a cohesive narrative -- while at the same time able to stand on their own. Throughout the book, they debunk numerous myths about startups and reveal some surprising truths. They explain, for instance, that the core of a startup is not always a world-changing and earth-shattering idea -- in fact, it is often the case that successful startups started out doing something else. They also underscore the efficiency of execution: great entrepreneurs know how to synthesize data, make a decision about the path they are going down, and execute. And they offer some alternatives to traditional ways of raising money, while stressing that you shouldn't start with the assumption that you need to raise money. Mastering the seven themes may not ensure success, but understanding the issues, reading the stories and getting advice pertaining to these issues will increase your chances dramatically. And if nothing else, you'll realize that you aren't alone in facing these challenges.Startups do almost everything at a disadvantage. Initially, most startups have less money than their competitors. Startups have less credibility. They have fewer customers. They have fewer employees, which means there are typically fewer people focused on things like marketing, sales, and product development. Resources are scarce at a startup. One of the things we talk about with our startups at Techstars is that they simply have to do more faster. This doesn't mean doing random stuff -- they still have to be thoughtful. But if they're not hyperproductive as small, nimble companies, then they're fighting from a real disadvantage. If a startup can't do more faster, it usually gets dead faster. Each vignette is an exploration of information often heard during the Techstars program and provides practical insights into early stage entrepreneurship. All royalties from the sale of the books Do More Faster and No Vision All Drive will now go directly to the Techstars Foundation. The Techstars Foundation is a non-profit created to improve diversity in technology entrepreneurship by providing opportunities for underrepresented entrepreneurs through grants, scholarships, and sponsorships. David is the Founder TechStars and Partner in the Techstars Venture Fund. He previously founded and successfully exited several companies and is now an angel investor in over 100 Internet startups. Brad is a managing director of Foundry Group, an early stage venture capital firm. He has been an early stage investor and entrepreneur for over twenty-five years.